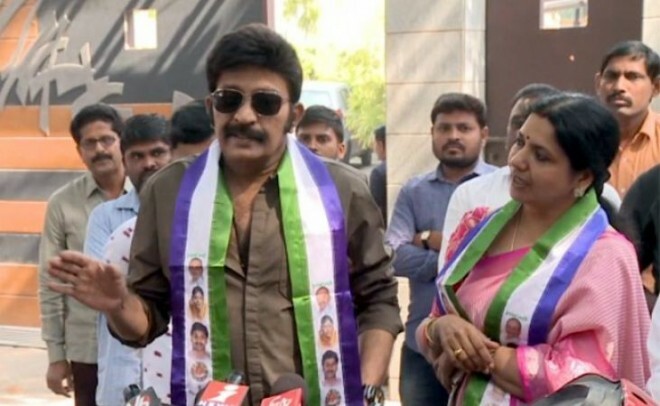 Amaravati, Apr 01: Celebrity couple Jeevitha and Rajasekhar on Monday re-joined the YSR Congress Party (YSRCP). Calling YSRCP president Y.S. Jaganmohan Reddy at his Lotus Pond residence the enthusiastic couple formally joined the party. Rajasekhar later told media that they met Jagan after a long time. He said that all the misconception between them was over, now and also admitted that he had behaved immaturely. He remarked that "today's Jagan is different from the earlier Jagan". The couple advised the people of Andhra Pradesh to give a chance to Jagan to serve them. They emanated confidence in the YSRCP chief to become the Chief Minister and assured him of their support.